For 5 Fridays out of 31, Carson was off or had no appointments. For 5 more he left before 2 p.m. to fly to South Florida, where he owns a mansion. WASHINGTON — Ben Carson's daily schedule from 2017 shows a HUD secretary who held senior staff meetings once a week, lunched with the author of "Chicken Soup for the Soul" and the founder of My Pillow, and left work before 2 p.m. on some Fridays to fly to his Florida mansion. The calendar also indicates that in 2017, HUD's senior staff huddled just once a week. Calendars previously posted by three other federal departments — Transportation, Treasury, and Labor — during the Trump administration show daily senior team meetings or multiple meetings a week. Three different 2017 calendars from Carson's office were obtained by the government watchdog group American Oversight through a federal lawsuit and provided to NBC News. NBC News recreated his schedule for the period covering April 7, 2017, to Nov. 1, 2017, using listings from the three calendars — one of them Carson's, the others from two of his assistants. "While I can't say whether the jumbled calendar was the result of innocent processing system or an effort to obscure information, the net result was that this is some of the most challenging transparency we have encountered," said Evers. In a statement, Carson said, "While the role of a Cabinet Secretary is to advise the President and run their agency, the role of NBC seems to be spinning incomplete information and misinforming the public. Looks like we are both doing our jobs." According to his calendar, on Friday, July 7, Carson had a 2:20 p.m. flight to West Palm Beach. On Friday, May 5, he left for the airport at 1:30 p.m. On Aug. 10, his schedule shows he left late on Thursday night for Florida and had no official appointments in his calendar documents for the following day. On Friday, May 26, his schedule reads "leave office" at 1 p.m. A week later, Carson's last meeting is listed at 1:30 p.m. On Friday, June 23, his last appointment ended before 2 p.m., according to the documents. The calendars show Carson frequently flew commercially at his own expense to South Florida. His schedule shows at least 12 such weekend trips from April 7 to Nov. 1, 2017, according to the documents. HUD defended the secretary's work schedule. "Almost every day the Secretary arrives at HUD by 7:30 a.m. to read over briefing material and prepare for meetings and travel. In 2017, the Secretary traveled to over 27 communities and met with more than 40 elected officials in their communities to discuss HUD business. In 2018, his travel and meetings increased and he visited more than 45 communities and met with over 60 elected officials in their communities." The calendars provided to American Oversight do not give insight into when Carson arrives, but the first appointments listed are generally at 9 or 10 a.m.
NBC News has previously reported that a dozen current and former HUD officials — both political appointees and career staff — describe a lack of urgency at the agency under Ben Carson. NBC News has also previously reported that Carson's signature initiative "EnVision Centers," which was intended to provide one-stop shops for social services at locations around the country, has yet to open any locations despite a program launch last June. 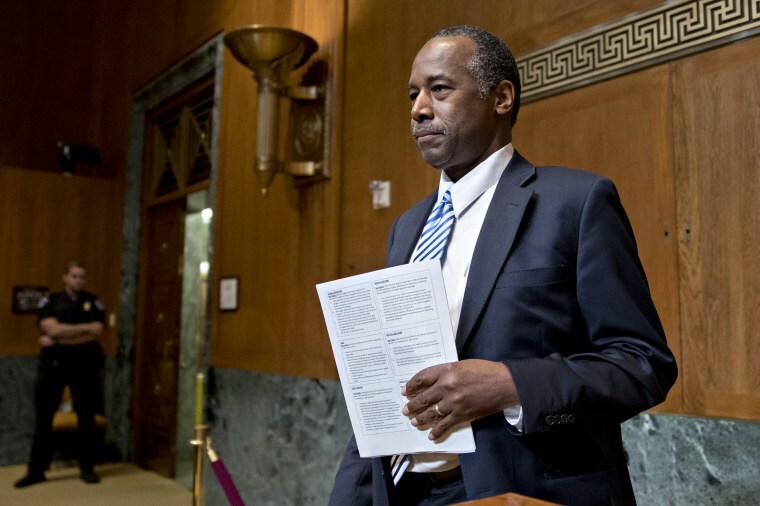 Last week, President Donald Trump's budget request for fiscal year 2020 showed Carson has proposed 18 percent cuts for his agency and again calls for tripling rents on those who live in public housing — a request that failed last year. Carson is also seeking to cut funding for public housing repairs, though each year 10,000 units of public housing are lost to decay, according to HUD. The calendars obtained by American Oversight also highlight the rapid turnover in Carson's top team. Carson's number two, Deputy Secretary Pam Patenaude, resigned in December. The former acting general counsel, Beth Zorc, is now lobbying for Wells Fargo, according to Senate records. Carson's former chief of staff Sheila Greenwood is now at the Consumer Financial Protection Bureau. Michael Bright, who ran Ginnie Mae, which guarantees mortgages, left in January. That leaves HUD official Brian Montgomery doing double duty as both the agency's No. 2 and the commissioner of the Federal Housing Administration. Trump cabinet secretaries vary widely when it comes to sharing their calendars. Former EPA Administrator Scott Pruitt's team fought fiercely to keep his calendar under wraps. Once obtained by The Washington Post, the calendar was an immediate window into his work. And when questions were raised about his living arrangements, it was his calendar that confirmed his meetings with lobbyists connected to his landlord. The Interior Department began posting a regular calendar for then-Secretary Ryan Zinke, but watchdogs have noted large gaps where meetings were labeled "external" with no attendees listed. The calendar for David Bernhardt, the current Interior secretary, has been posted through mid-February. One of the most transparent offices has been Labor Secretary Alex Acosta, whose office posts his calendar every month on the agency's website. Treasury Secretary Steve Mnuchin's calendar is posted online, but it's almost a year behind schedule, with the last public calendar from June 2018. Suzy Khimm and Courtney McGee contributed.